It’s a real shame that lacrosse doesn’t feature on the events itinerary in Beijing this summer. After all, it is through exposure on television that so many of the so-called “minority” sports reach a wider audience and inspire individuals to join in who would otherwise restrict themselves to the football or rugby pitch, or the local tennis court. While lacrosse still has to rely on information channels such as school initiatives and the word of mouth of relatives and friends who enjoy playing the sport, it is never going to hit the headlines as often as it deserves. Never the less, those for whom it does spark an interest have a decent amount of options available to do them to get involved. 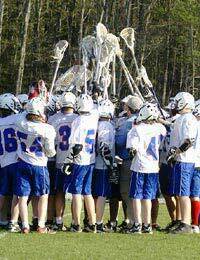 If you don’t already know a member of a local club, the obvious place to start your research is one of the national associations, for example www.englishlacrosse.co.uk; lacrossescotland.com; or www.lacrosse.org, which feature sections devoted to local clubs, or chapters, that include contact details. In the majority of cases, you will find that it is simply a matter of packing your sports shoes and gym kit into a bag and turning up for one of the practice sessions. (These sessions are usually held early evening or weekend mornings for juniors, with seniors taking up the later slots.) Thanks to fundraising and, in some cases, grant awards, clubs are usually equipped with sticks and protective equipment that allow prospective new members the opportunity to try out the sport without the need for any financial outlay. In terms of age groups, many clubs run both adult and junior programmes, while the different male and female codes call for separate sections for the sexes. In addition you may find your local group runs a mixed section, too. Once you are up and running, it is a case of finding out whether the club environment is right for you. As with all team sports, there is nothing wrong with healthy competition, either in practice sessions or during organised matches against other clubs. But while the majority will be involved simply for the enjoyment of playing, together with the physical and emotional benefits of the rigorous workout involved, other club members may want to push themselves to the maximum in the hope of making the breakthrough to a higher level. It is important that the club ensures that everyone’s aims are catered for, and no-one feels left out because they may not take the game as seriously as others. In short, if you feel there is an element of over-competitiveness, think seriously about changing clubs. Not only will joining a club provide a good introduction to the game but it may provide an extra dimension to your social life. Parents whose children attend a school that participates in Pop Lacrosse will be better able to contribute and enjoy this dimension of their kids’ curriculum. They may be inspired to think about taking a supporting role by means of a coaching or umpiring course. However all that may be a long way in the future. In the here and now, it’s about firing your enthusiasm for the game by getting involved. Play hard but fair and you’ll find the most important goal you’ll ever register – that of enjoying the game – isn’t long in arriving.